I’ve recently found an entertaining picture. 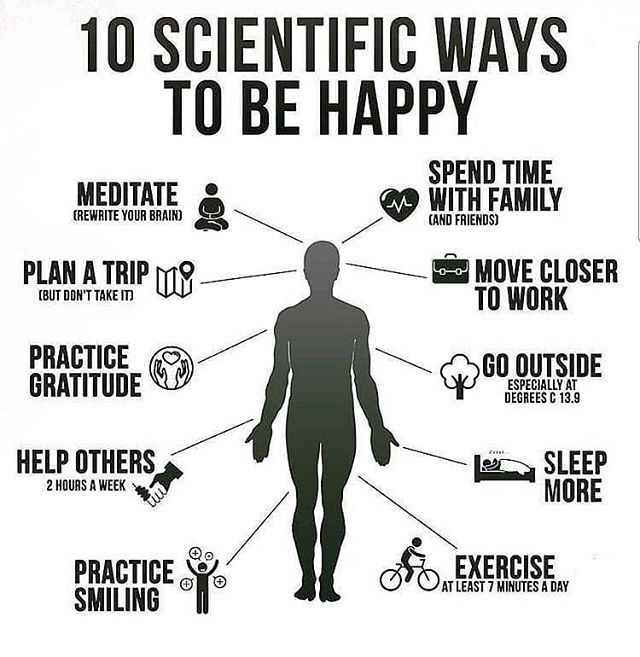 The huge headline said: 10 SCIENTIFIC WAYS TO BE HAPPY. I do love various lists or ratings and therefore I decided to read through it thoroughly and find out how these ways work or do not work in order to make you happier. First, what is happiness? Do you perceive yourself as a happy person? What makes you happy? Happiness is used in the context of mental or emotional states, including positive or pleasant emotions ranging from contentment to intense joy. That is the common definition. Does it make clear what happiness is? Hope it does. Anyway, it is obviously the feeling which influences your inner world with an effect on your productivity, attitude and improves some more traits. Let’s look at the picture and discuss the ways to be happy. It is arguable but after reading this article you will realise whether these are an advice for you or you need something else. Do not think that there is a universal approach to happiness. There are always exceptions. At the same time, there are some ways which might help you. What does it mean? It is not only about the direct meaning of the word “meditation” but also about you staying 1 to 1 with your inner world, with your mind, facing real you. It is the time when you can evaluate your actions and life in general, think what is important for you and what is from the society requirements; the time when you are absolutely sincere and honest before yourself, you are listening to real you. So, it is, in fact, rewriting your brain. After analysing everything you’ve done, the ways to solve the problems and creativity come and you feel renewed like starting with a clean slate. From my point of view, this one is the nicest. Your brain works in an amazing way. It does not matter whether you go on a trip or simply planning it, the process of preparation: searching for the hotel and the exact place to go, reading about places to go and checking prices and routes, imagining yourself laying on the beach and drinking a cocktail or wearing a winter outfit for skiing/snowboarding – will bring that satisfying feeling for you. Moreover, it is far from being expensive as you do not have the obligations to go anywhere. This is about being grateful. It is a pleasure to be told and tell the word “thanks”. This makes both people happy. It is so simple but works every time. When you are grateful for things you have in your life, say “thank you” to the universe or any power you believe in, when you are grateful to people around you, say “thank you” to them. Share this spark with others and you will receive even more in return. How does that sound? You have to smile to be happy. It is the scientific fact that we associate the smile with happiness. Indeed, when you see somebody smiling, your lips get smiled and this time your unconscious works. You just have a reflex or a habit, call it as you wish. The more you smile the happier you are. Remember this and even if you have troubles just smile and decision will come to your mind. Be healthy is one of the components of happiness. You need to be healthy mentally and physically. Regular exercises allow you to keep your body strong and in shape. The gym workout gives you time to relax mentally and work physically, both are good. What is more, after the session you feel that muscle pain which reminds you that you’ve done a good job and your body is getting more attractive. It is not for everyone but I am sure if you want you are able to find the sport you will like and enjoy. It may be anything. Use a skipping rope or a ball, play with children or help to move the furniture around to change the interior. Just find some time (regularly) and you will feel the difference. The most obvious fact I suppose. Our body needs rest and sleep is the right way of doing it. I am not going to tell you all about the processes of recovery while sleeping or anything like that but I do want to comment here that everything should be in the right quantity, even sleep. Listen to your body and do not stay awake at midnight if you wanted to sleep at 10pm. Be wise and care about yourself. It is a scientific fact that fresh air is required for your body and brain. It is crucial for faster and more efficient work. Treat yourself with the walk. Do not hurry and just breathe and feel how the fresh air intrudes in your body. I am not sure about the temperature they mentioned but I know that the temperature 18 degrees are counted as the optimal for a human. Of course, this point is the way to be happier. Moving closer to work is a chance to save time. And we all know that time is the most valuable resource we have. You can use this time for work, hobby, family and friends, rest or anything you want. Just imagine, no traffic jams and early alarm, no rush (it is up to you..) and additional time to finish the things you did not. It is significant to spend time with your family and friends. First, they are changing your routine and share their stories to entertain you. Second, they are the people who value you and who are valued by you. They always will listen to you and try to do at least something to improve your situation or find the solution for the problem you have. They also always support you and tell the truth when it is necessary. Or and they even can help you with money if you have a crazy idea for a business. These people can make you upset but at the end of the day, you know that they are always here and you are not alone. Finally, we are about to finish for today. Hope you’ve made the conclusion and decided what rules are for you. This is a list of some things which can make you happier but, of course, everything is individual. Listen to yourself and follow the inner voice. Wish you to be happy and become happier day by day!